Spain is spearheading the introduction of the first facial recognition pilot project in Europe, thanks to airport operator Aena and Air Europa’s collaboration. Biometric technology will speed-up boarding area control, identification and access processes. Biometric identification technology streamlines airport passenger movement by facilitating free, faster, safer and more efficient transit. This technological breakthrough aims at simplifying boarding procedures, until now an enormously tedious process compared to other forms of transport such as trains and buses. The airport chosen to carry out this pilot project is Menorca, where Air Europa passengers wanting to try out this system will be able to do so by means of a simple procedure in process until the pilot project, initially scheduled for one year, ends. If they match, the passenger will be able to go through both the security checkpoint and boarding gate without having to show their travel documents and ID again, although they should always have them to hand. Needless to say, any passengers who do not want to make use of this facial recognition system may proceed as before, by showing their boarding pass and ID. 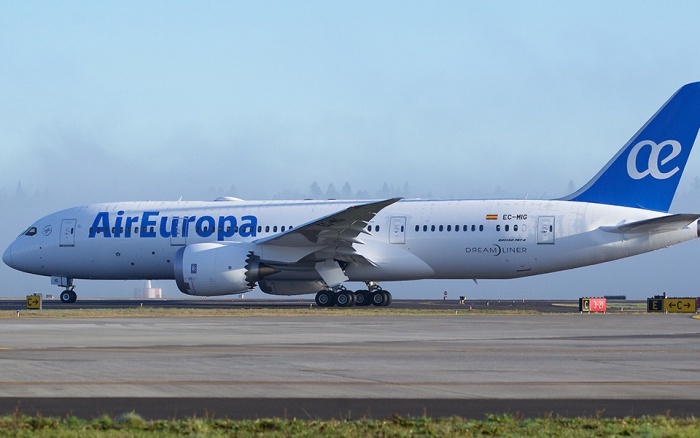 Facial biometric boarding has been facilitated by the joint collaboration of Aena; Air Europa and GroundForce, both belonging to the Globalia Group, along with Everis Aerospace & Defence and Dormakaba. Utilising the latest innovations in mobile technology, Oman Air’s new app is a user-friendly platform with easy steps, providing guests with inclusive trip management capabilities like flight booking, online check-in, pre-selection of seats, flight status as well as information about the carrier’s latest offers. The app also enables guests to check their Sindbad miles balance, claim any missing miles, request for redemptions, keep track of tier progress, see their upcoming bookings on Oman Air, and much more. The app, which is available in both English and Arabic language versions, is designed to be simple and informative. Furthermore, the app makes it easier than ever to book flights with Oman Air using credit or debit cards. The booking and purchase of tickets is completed in just a couple of clicks or taps on customized screens. Oman Air’s launch of the revamped app is the latest in a series of digital developments at Oman Air which offer even greater convenience for its customers. As the carrier continues to expand with new destination, codeshares and fleet, attracting international acclaim for the quality of products and services, its award-winning digital presence is also ensuring that it is more accessible and responsive to the needs of its guests. Oman Air is considered the World’s Leading Airline – Economy Class by voters at the World Travel Awards.